The conclusion of an agreement between Turkey and the U.S.-led anti-ISIS coalition to open Turkish airbases for coalition aircraft conducting sorties against the Islamic State of Iraq and al-Sham (ISIS) marks a major shift in Turkish policy which will provide immediate boost to U.S. efforts to degrade and ultimately defeat ISIS. At the same time, Turkey began launching airstrikes and internal crackdowns targeting members of both ISIS and the outlawed Kurdistan Workers’ Party (PKK) in the wake of several days of violence which included an ISIS-linked SVEST attack inside Turkey and several PKK-linked assassinations of Turkish police officers. Turkey’s decision to escalate against both militant groups suggests that Turkey intends to leverage the coalition’s calls for further action against ISIS in order to assert its own strategic interest in limiting the expansion of armed Kurdish groups along the Turkish border. The government of Turkish President Recep Erdogan may also seek to utilize these security threats to increase its own political standing amidst ongoing negotiations to form a coalition government and a potential call for early elections. Over the near-term Turkey will face an expanded domestic threat from both ISIS and PKK militancy in the form of persistent violence against the Turkish state. Nonetheless, a sustained Turkish effort against ISIS’s networks in Turkey and northern Syria combined with the efforts of local anti-ISIS Syrian opposition forces has the potential to significantly disrupt the foreign fighter flows which provide ISIS with a key source of reinforcements, suicide bombers, and legitimacy as a global caliphate. Turkey significantly increased its participation in the U.S.-led anti-ISIS coalition in a marked shift from its previous hesitancy to directly engage the Islamic State of Iraq and al-Sham (ISIS). The Turkish Ministry of Foreign Affairs released a statement on July 24 confirming that Turkey and the U.S. had agreed to “further deepen their ongoing cooperation in the fight against ISIS” following a telephone conversation between U.S. President Barack Obama and Turkish President Recep Erdogan on July 22. Although the exact details of the deal remain unknown, President Erdogan confirmed that the Turkish government granted the U.S.-led anti-ISIS coalition access to the strategic Incirlik and Diyarbakir Airbases in southern Turkey “within a certain framework” in a move long sought by the U.S. to stage operations near Syria. The opening of these bases would sharply reduce the distance that coalition aircraft must transit to strike ISIS targets in Syria, allowing for an increased rate of daily combat sorties. 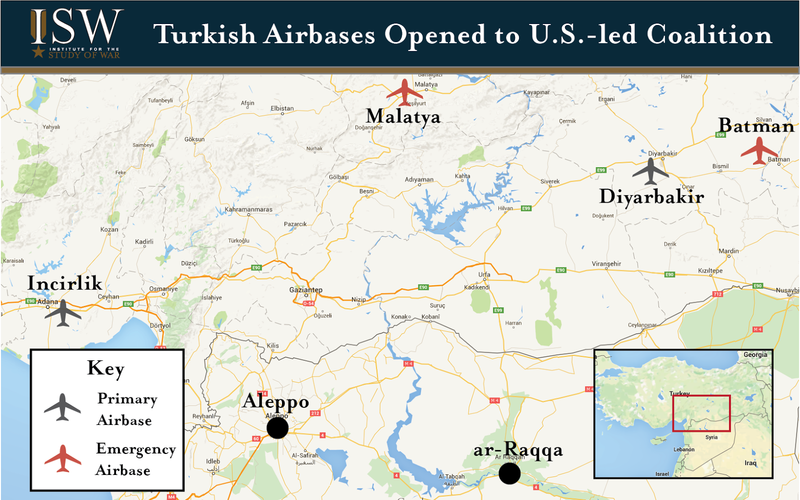 The Turkish government also reportedly authorized the U.S.-led coalition to utilize airbases in the southern cities of Batman and Malatya for emergency situations. The Turkish Ministry of Foreign Affairs also announced that Turkish warplanes will directly participate in the international anti-ISIS coalition air campaign for the first time. Turkey launched the opening salvo of this expanded role in the morning of July 24 as three Turkish F-16 fighter jets departed from Diyarbakir Airbase in south-central Turkey and conducted three airstrikes against ISIS targets in the Syrian border town of Hawar Kilis north of Aleppo City. Turkish media sources reported that the strikes comprised part of a newly-declared Turkish military operation named “Martyr Yalcin” after a Turkish non-commissioned officer killed during a gunfight with ISIS militants along the Syrian border on July 23. A second round of Turkish airstrikes on the night of July 24-25 also targeted positions of the outlawed Kurdistan Workers’ Party (PKK) militant group in northern Iraq for the first time since 2011, effectively ending a two-year ceasefire agreement between the PKK and the Turkish government. Turkish Prime Minister Ahmet Davutoglu stated that the airstrikes were not an isolated incident but rather part of an ongoing “process” to address threats along the Turkish border. Nonetheless, one Turkish government official speaking to Reuters later noted that “we can't say this is the beginning of a military campaign, but certainly the policy will be more involved, active and more engaged.” These statements imply that Turkey intends to sustain its activities against ISIS and the PKK over a long-term campaign. The outlines of this agreement between the U.S. and Turkey appear to have been laid during a visit to Turkey by Gen. John Allen (ret.) and U.S. Undersecretary of Defense Christine Wormuth on July 7-8. Unconfirmed reports at the time suggested that the talks had resulted in preliminary approval for the coalition’s use of Incirlik Airbase after Turkey received assurances that the U.S. would consider Turkish proposals for a buffer zone in northern Syria and block any attempt by Syrian Kurdish forces to move into areas along the Turkish border west of the Euphrates River. These accounts suggested that Turkey had offered a major concession by dropping its long-standing insistence that the international coalition expand its air campaign against ISIS to include airstrikes against the regime of Syrian President Bashar al-Assad. This rebalancing suggests that recent developments may have led the Turkish government to prioritize the internal security threats posed by ISIS and the PKK over Turkey’s regional concerns regarding Iranian expansionism and the enduring presence of the Syrian regime. The successful conclusion of these negotiations following months of talks likely came as a product of the intensifying security concerns facing the Turkish government. Turkey had previously avoided overt confrontation with ISIS and other militant groups transiting through its territory in order to apply indirect pressure to both the Syrian regime and the Syrian Kurdish YPG, which the Turkish government views as an offshoot of the PKK. This stance also enabled Turkey to limit the potential for violent terrorist attacks within its borders by providing an incentive for ISIS and other extremist groups to avoid jeopardizing their supply routes through Turkey by disrupting the status quo. Although the existence of these transit pathways represented an implicit threat to Turkey, the seizure of the border town of Tel Abyad in northern Syria from ISIS on June 15 by Kurdish YPG forces appears to have been the primary trigger which forced Turkey to reevaluate its security policies. The prospect of further gains along the Syrian-Turkish border by PKK-linked Kurdish forces directly supported by the U.S.-led coalition likely generated the impetus for Turkey to further engage with the anti-ISIS coalition in order to ensure that the coalition campaign would evolve in line with Turkey’s own strategic interests. The Turkish government soon moved to link its concerns regarding the Kurds to the security threat posed by ISIS in a likely attempt to attract buy-in from the U.S.-led anti-ISIS coalition for the imposition of limits on further Kurdish expansion. President Erdogan called security meetings with senior Turkish government and military officials on June 17-18 which established “red lines” for further Kurdish expansion in Syria. The Turkish National Security Council held additional meetings to address the threat posed by ISIS, and on June 29 an advisor to Prime Minister Davutoglu stated that the meetings would likely result in a change to the Turkish military’s rules of engagement that would authorize attacks against ISIS fighters inside Syria near the Turkish border. Over subsequent weeks Turkey reinforced its border with largenumbers of soldiers, armored vehicles, and artillery units, placing a particular concentration in Kilis and Gaziantep Provinces opposite ISIS-held areas of Aleppo Province in Syria. By July 22, Turkish media reported that half of Turkey’s border security personnel and armored cars as well as 90% of Turkey’s drones had been deployed to the Syrian border. Meanwhile, Turkey also began a crackdown against suspected ISIS members or sympathizers inside Turkey. President Erdogan noted on July 10 that nearly 1,300 foreigners had been arrested and deported on suspicion of involvement with ISIS. These security concerns dramatically escalated on July 20 after a suspected ISIS member conducted a spectacular SVEST attack against a group of pro-Kurdish student activists in the southern Turkish town of Suruc on July 20, killing at least thirty-one individuals and wounding over one hundred others. Kurdish activists linked the bombing to a similar double IED attack against a Kurdish political rally in Diyarbakir on June 6 which killed four individuals and wounded at least 400 others, raising the prospect of an incipient ISIS campaign to target Kurds inside of Turkey. This message was reinforced with the release of the second issue of ISIS’s Turkish-language Constantinople magazine on July 21 which contained a warning that Kurds fighting ISIS in Iraq and Syria “may fight in Turkey in a similar way in the not too distant future.” In response, Kurdish militants engaged in their own campaign of targeted violence against alleged ISIS “collaborators”, triggering a major amplification of violence within Turkey. The PKK claimed responsibility for the execution of two Turkish police officers with a claimed association to ISIS in the border town of Ceylanpinar on July 22. Suspected PKK members also killed another Turkish police officer in an ambush in Diyarbakir, while members of the PKK youth wing executed an alleged ISIS member in Istanbul. Turkish security forces also discovered IEDs in front of two offices of the ruling Justice and Development Party (AKP) of President Erdogan in the Turkish capital of Ankara and the southwestern Turkish province of Hatay. Kurds and Turkish opposition parties held large streetprotests in Istanbul, Ankara, and several other Turkish cities which in some cases devolved into violence. The threat posed by this spiral of violence likely played a role in expediting the final agreement between the U.S. and Turkey. On June 24, simultaneous with the implementation of the agreement, Turkish security forces launched a wave of arrests targeting suspected ISIS, Kurdistan Workers’ Party (PKK), and leftist Revolutionary People’s Liberation Party-Front (DHKP-C) members throughout thirteen Turkish provinces which detained at least 297 individuals. Local media reported that the raids involved thousands of police officers and Special Forces soldiers supported by helicopters. CNN Turk reported that anti-terror police raided over 140 locations in the major city of Istanbul alone, detaining ninety individuals including thirty foreigners. The office of Prime Minister Davutoglu later released a statement pledging to fight all transnational “terrorist” groups “without distinction.” A senior Turkish official characterized the airstrikes in Syria and the domestic raids as dual “preventative measures” conducted in line with a policy decision to “move to active defense from passive defense” that had been formalized during an emergency “Special Security Meeting” on July 23. This confluence of events may have provided the final stimulus for Turkey to adopt a more aggressive stance against ISIS in exchange for the acquiescence of the U.S.-led coalition towards Turkish military action against the PKK. The timing of the start of combat operations against both ISIS and the PKK may also have been driven by domestic Turkish political concerns. President Erdogan and his ruling AKP Party have come under heavy criticism from domestic opponents for their foreign policy towards Syria, which included a permissive attitude towards ISIS, JN, and other extremist groups fighting the Assad regime in Syria. These mounting criticisms came to a head during the Turkish general elections on June 7 in which the AKP lost their overall majority in the Turkish Parliament amidst historic gains for the pro-Kurdish People’s Democratic Party (HDP). This development raised the potential for a shift in Turkish policy towards the Syrian Civil War as Turkish opposition parties pressed the AKP to reduce its hostility towards Syrian President Bashar al-Assad, limit its support to Syrian opposition factions, and establish positive relations with Syrian Kurds. Nonetheless, ongoing negotiations between the AKP and rival Turkish political parties to form a coalition government do not appear to be gaining traction and a call for early elections in Turkey appears likely. Expanded Turkish participation in the anti-ISIS coalition may thus serve a political goal for President Erdogan and the AKP by undercutting criticism of government policy towards ISIS and rallying the Turkish populace in the face of domestic security threats. The increase in violence attributed to the PKK and other Kurdish militant groups will also likely erode the position of the HDP to the benefit of the AKP. If early elections are called, these effects could improve the AKP’s vote share sufficiently to allow the AKP to regain its outright parliamentary majority and advance its Syria policy unhindered. The expansion of Turkey’s role in the U.S.-led anti-ISIS coalition will almost certainly generate an immediate reaction in the form of retaliatory attacks from ISIS or ISIS sympathizers operating inside of Turkey. Thousands of foreign fighters have utilized Turkey and its porous border with Syria as a pathway to join with ISIS forces in Syria and Iraq, including an estimated 1,000 Turkish citizens. The members of these covert ISIS networks represent a key threat to Turkey’s internal security, and ISIS will likely seek to activate these cells in order to punish the Turkish government. ISIS fighters and supporters began circulating violent rhetoric against the Turkey within hours of the Turkish airstrikes on July 24. At the same time, Turkey also faces expanded internal turmoil in its southeastern Kurdish-majority provinces due to the resumption of hostilities with the PKK and other Kurdish militant groups. These two simultaneous threat streams will likely interact to prompt further attacks inside of Turkey in coming weeks targeting the Turkish government, Turkish military forces, or vital Turkish interests such as the tourism industry. Turkish intervention in Aleppo Province could also prompt a response from Syrian al-Qaeda affiliate Jabhat al-Nusra (JN) and JN-aligned Salafi-jihadist groups operating along the Turkish border. Unverified Turkish sources identified both ISIS and JN as targets for Turkish and U.S.-led coalition airstrikes. JN later claimed on July 24 that aircraft from the “Arab-Crusader alliance” had conducted airstrikes against JN positions in the town of Baraghitah in northern Aleppo Province. Baraghitah is located directly adjacent to the announced location of Turkish airstrikes in the town of Hawar Kilis, suggesting that Turkish aircraft may have also conducted strikes against JN. 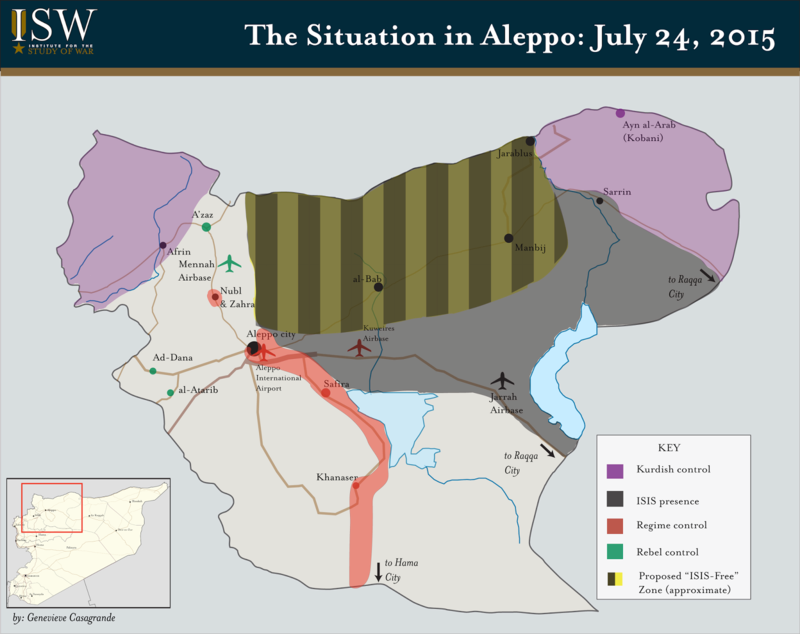 Although JN remains unlikely to directly escalate against Turkey due to its own reliance on supply lines running through the Turkish border, sustained targeting of JN could ultimately drive the group to conduct attacks against Turkey or Turkish-sponsored rebel groups operating in Aleppo and Idlib Provinces. Meanwhile, Turkish military action against ISIS forces in northern Syria could produce significant ramifications for the current balance of power between ISIS, Syrian rebels, and the Syrian regime in Aleppo Province. A sustained campaign of Turkish airstrikes and artillery shelling designed to force ISIS away from the Turkish border would likely open exploitable opportunities for rebel forces to advance against ISIS in the northern countryside of Aleppo City, reversing ISIS’s recent gains in the region and reducing the threat posed to the key rebel supply line moving from Turkey through the Syrian border town of Azaz. Over the long-term, ISIS’s position could be sufficiently weakened to enable advances by both rebel and regime forces east of Aleppo City, which could ultimately threaten ISIS’s control over the key urban centers of al-Bab, Manbij, and Jarabulus. Turkey will also likely seek to leverage these rebel advances as a means to block further Syrian Kurdish advances in Aleppo Province along the Turkish border. On a wider scale, the campaign of mass arrests and invigorated border security efforts undertaken by the Turkish government could result in a significant disruption of the foreign fighter flows which provide ISIS with a key source of reinforcements, suicide bombers, and legitimacy as a global caliphate. The intersection of these effects with potential losses of terrain in Aleppo Province would likely inflict significant damage to ISIS’s operations within both Iraq and Syria. ISIS may thus attempt to reduce its overall risk profile by setting conditions over the near-term to secure additional border access, particularly in the opposition-held province of Idlib in northwestern Syria which has seen a series of recent ISIS-attributed assassinations and bombings. The increase in Turkish support to the U.S.-led anti-ISIS coalition through expanded border security, airstrikes, and airbase access will deliver an immediate boost to U.S. efforts to degrade and defeat ISIS in Iraq and Syria. Nonetheless, Turkey’s decision to escalate against both ISIS and the PKK will also produce a number of challenges for the U.S. and its coalition allies in the near-term. The high likelihood of retaliatory attacks in Turkey directed by both Salafi-jihadist and Kurdish militants suggests that the U.S. will witness persistent violence in a major NATO ally. U.S.-led coalition personnel stationed at newly-opened airbases in Turkey may come under particular risk of attack due to the heavy presence of ISIS networks in the country. The U.S.-led coalition could also face pushback or reduced cooperation from the Syrian Kurdish forces that have formed the core U.S. ground partner in Syria as a result of renewed hostilities between the Turkish government and the PKK. Over the long-term, however, the expansion of the Turkish role against ISIS will likely mark a major positive development for the U.S.-led anti-ISIS coalition and its efforts to dismantle the Islamic State. Key Take-away: ISIS is re-establishing its former strength in Diyala province, and security in the province is deteriorating. This resurgence is likely the result of security gaps left by the forward deployment of Diyala-based Iranian proxy groups, mostly the Badr Organization, and forces from the 5th Iraqi Army division to areas in Salah ad-Din and Anbar. ISIS is likely exploiting this gap in order to compromise ISF and militia operations in Anbar province, diverting attention to Diyala and threats near the Iranian border. If the ISF and Shi’a militias cannot secure Diyala while maintaining their operations in Anbar, Iran may become more involved in Iraq to secure its own border. The presence of ISIS in Diyala in 2015 is not a new phenomenon. The organization and its predecessor, -Qaeda in Iraq (AQI) were active in the province throughout the last decade. Former leader of AQI, Abu Musab al-Zarqawi was personally based in Hib Hib, west of Baquba, suggesting that Diyala played a central rather than peripheral role in AQI’s national campaign. The footprint of AQI decreased following major operations of U.S. and Iraqi forces during the “Surge” between June and November 2007. During the resurgence of AQI in 2012, however, AQI’s signature VBIED attacks returned to Diyala, suggesting that AQI had reconstituted former support zones along the Hamrin Ridge and had become operational in the province once more. In November 2013, AQI, which had re-branded itself as ISIS, launched a complex attack involving three suicide bombers, two VBIEDs, and IEDs targeting the Police Headquarters in Baquba. This event indicated that ISIS had developed a more sophisticated attack capability, already witnessed elsewhere in Iraq with successful prison breaks in Abu Ghraib and Tikrit, and this capability was also present in Diyala. Most indicators of ISIS’s activity in Diyala in 2012-2013 appeared concentrated north of the city of Muqdadiyah, a historic AQI support zone. In March 2014, however, ISIS launched an urban assault and briefly took control of central Buhriz, south of Baquba. The attack occurred two months after ISIS attacked Fallujah and Ramadi in Anbar province and three months before ISIS seized Mosul and many other northern cities, including cities in northern Diyala like Jalula and Sadia. This early attempt to capture urban terrain in Diyala’s heartland not only marked a shift in the operations of ISIS in Diyala from terrorist attacks to urban maneuvers, but it also shed light on a security gap in the province at the time. Of note, Badr forces that had been assisting the Assad regime in Syria in 2013 were absent from Diyala at the time. Badr’s veteran forces returned in June 2014 from Syria, where they had been augmenting the Assad regime along with a number of other Iranian proxy groups, reflecting a shift in Iran’s theater priorities from Syria to Iraq after the fall of Mosul. 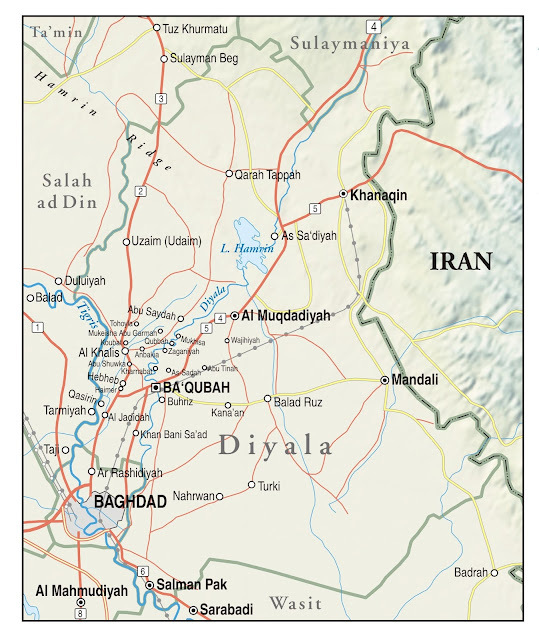 Diyala’s security in particular directly affects Iranian homeland security, as Diyala province shares a 197 km border with Iran. The convergence of security forces upon Diyala after June 2014 created a unique security dynamic. The official military body responsible for security in the province is the Dijla Operations Command (DOC), comprised of the 5th Iraqi Army (IA) division and local and Federal Iraqi Police. However, Diyala is also a home base of a prominent Iranian-backed Iraqi Shi’a militia, the Badr Organization, which has been operating as an Iranian proxy since the 1980s.The leader of the Badr Organization, Hadi al-Ameri is also a native of Diyala. Following the collapse of several ISF units in northern Iraq in June 2014, the power of DOC essentially transferred to Ameri personally following his official appointment by the local government as head of Diyala security in June 13, 2014. The appointment of another Badr leader as the governor of Diyala a year later in May 2015 would enforce the authority of Ameri over Diyala’s security forces, most evident in July 2015 after recent attacks by ISIS in Diyala. Between June 2014 and January 2015, Iranian-backed Iraqi Shi’a militias such as Badr and Asai’b Ahl al-Haq (AAH), the ISF, and the Iraqi Kurdish Peshmerga of the Patriotic Union of Kurdistan (PUK) carried out several operations in Diyala to block and clear ISIS. Initial operations were defensive and aimed to stop the advance of ISIS along the Baghdad-Kirkuk highway at al-Udhaim. These operations successfully concluded in August 2014. Additional joint operations with the PUK Peshmerga took place in northeastern Diyala, resulting in the recapture of Sadia and Jalula sub-districts in November 2014. Finally, Iranian proxies, ISF, and small contingents of Sunni fighters reclaimed the agricultural areas north of Muqdadiyah at the top of the Diyala River Valley in January 2015. The latter operation represented the recapture of the last ISIS stronghold in the province; however, all of these operations took place in northern Diyala. It is unclear whether Badr and the ISF secured southern Diyala fully at the time. Nevertheless, it was celebrated by the proxies and ISF as the “liberation of Diyala.” The Badr Organization played a major role in all operations launched against ISIS in Diyala during this period. After achieving success in Diyala, the Badr organization capitalized on momentum and deployed as a mobile force along with DOC to launch major operations around Dhulueya and Tikrit in nearby Salah ad Din province November 2014 and March 2015. The Badr Organization is still deployed forward in the desert area in southern Salah ad Din and around Fallujah in eastern Anbar as of July 2015. These operations generated significant population displacement of Iraqi Sunnis in Diyala. The ISF with Iranian proxy groups drove Iraqi Sunni communities out of their homes and into IDP camps in the name of clearing ISIS’s safe havens. Most of the IDPs are yet to return to their homes, a result of rigid security procedures that aim, according to local officials, to prevent the return of ISIS’s sympathizers. Given the high influence of Badr in Diyala’s affairs, it is most likely that such measures are orchestrated by the Badr Organization to further sectarian aims. Diyala’s population is ethnically and religiously mixed, and the sectarian agenda of Iranian proxy groups has likely accumulated tension in Diyala province over the course of tactical successes against ISIS. If current IDP levels in Diyala persist through the provincial elections in 2017, it is unlikely that Iraqi Sunnis will be able to fill a similar number of seats on Diyala’s provincial council, which would ultimately undermine their influence in the government. Most importantly, this outcome would further marginalize Sunnis in Diyala and create conditions similar to those that allowed AQI and ISIS to flourish in Diyala and elsewhere in Iraq. It should be noted however, that the PUK Peshmerga also played a role in re-securing northern Diyala from ISIS, particularly in Jalula and Khanaqin near Iran’s northern border crossing. The Peshmerga also facilitated Iraqi Sunni population displacement in these areas. Furthermore, the success of Badr’s combat operations in Diyala nevertheless increased its popularity among civilian communities and its leverage in political and military circles. Key positions such as the governor have since witnessed intense political jockeying. Historically held by Iraqi Sunnis, the governor post is now held by a previous chairman of the council, who is also a senior figure of the Badr Organization, Muthana al-Timimi. The appointment of Timimi as governor was technically legitimate: on May 26, 2015, 16 out of the 29 members of the council voted for Timimi while 12 members of the Iraqi Sunni Iraqiyat Diyala bloc boycotted the session. The decision was later approved by the presidency on June 8, 2015. As evident by the boycott, which continues today, the election generated a major backlash from Iraqi Sunnis in the council who consider the governor’s post as their right. Badr’s role within Diyala’s provincial politics has likely increased with its rise to the national stage, as Badr played a lead role in operations against ISIS in other provinces, such as Babil, Salah ad Din and Anbar. Badr’s operations outside of Diyala likely reflected its earlier assessment that Diyala is relatively secure, against ISIS and against sectarian backlash for its activities in 2014. 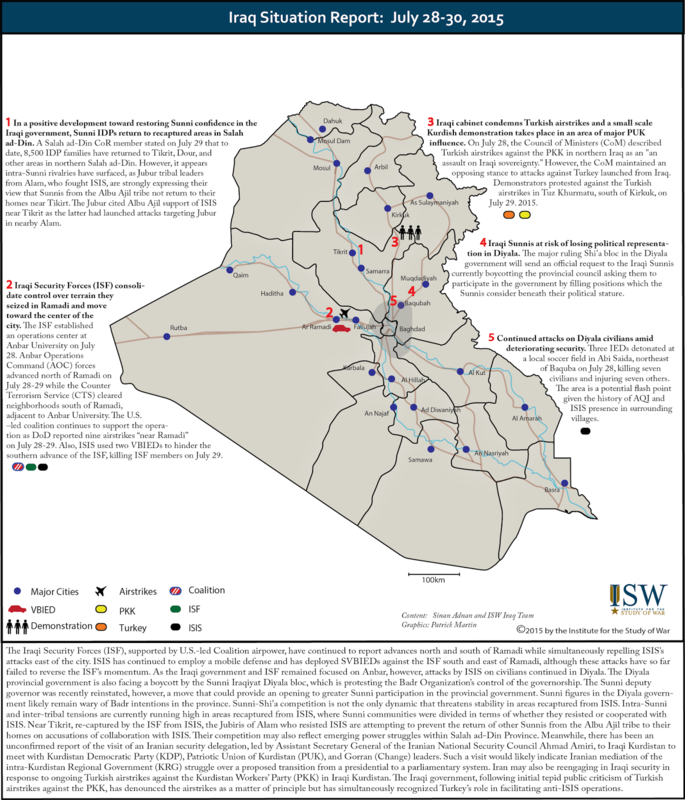 Since July 17, however, ISIS launched attacks in Diyala that demonstrate its likely resurgence. ISIS detonated a massive VBIED on July 18 that resulted in the death of at least a 120 individuals and injury of 130 others in Khan Bani Saad, south of Baquba. This attack occurred during the Eid al-Fitr holiday at the end of Ramadan and constitutes one of the deadliest attacks ever perpetrated by ISIS or its predecessor. Like Buhriz the year before, this attack indicates that ISIS can reconstitute in southern Diyala as well as in the north. A southern attack zone implies that ISIS can get to Baquba and eastern Baghdad through remote areas that may not have been cleared by the Badr Organization and the ISF in 2014, such as Balad Ruz, Kanaan, and Nahrawan. It also suggests that ISIS may have greater presence in Tarmiyah than recent attack trends would independently indicate. Underscoring the possibility of a remote ISIS support zone in eastern Diyala, another VBIED attack occurred on July 21 targeting the Jisr area, west of Mandali in eastern Diyala, killing five and injuring 12. Either in high volume or in combination with other attack types, VBIEDs generally indicate a threshold of capability above isolated terrorist attacks. Manufacturing and employing VBIEDs is a highly technical operation that requires specific precursors, indicating that ISIS possesses expertise and access to the province to the south and east. ISIS also launched mortars on July 20 targeting the area of Hadid west of Baquba, killing two individuals and injuring 20 others. ISIS has used VBIEDS and mortars to support attacks upon military positions in the past, and it is possible that ISIS’s individual weapons capabilities are coming on line across Diyala in a way that will heighten the overall threat of complex attacks. Therefore, seemingly isolated incidents in Diyala that are occurring in greater frequency in July 2015 likely indicate a step change in the organization’s capability and intent in Diyala. ISIS may not yet be able to execute the kind of complex attacks and urban maneuvers that it exercised in Diyala in late 2013 and early 2014, but there is again a security gap opening in Diyala, and ISIS is likely to exploit it. 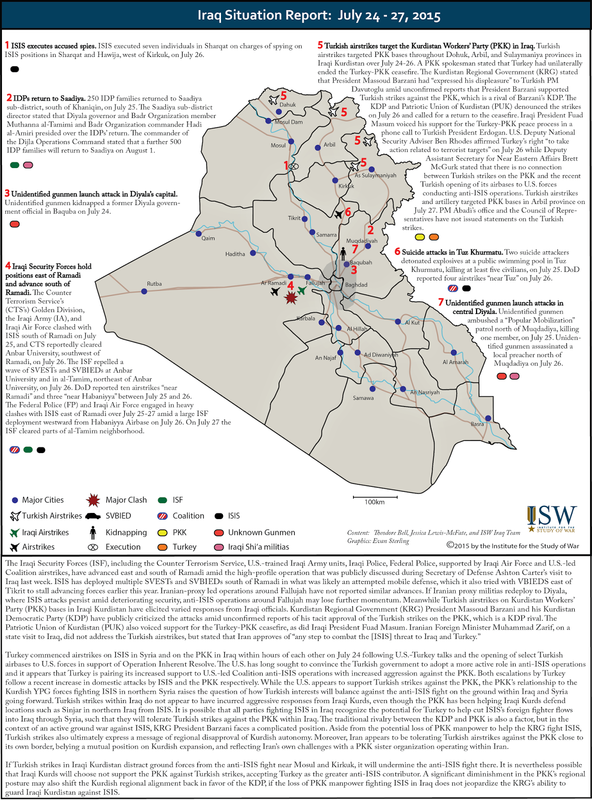 Indicators of ISIS’s return to Diyala have actually been occurring for several months. On May 9, at least nine ISIS prisoners escaped from prison in Khalis, in western Diyala following clashes with guards. There were conflicting reports regarding the exact nature of the attack. Some sources reported that it was entirely done from inside the prison. Others reported VBIEDs targeting the prison as part of the attack. Either way, ISIS has likely been involved in orchestrating the escape which likely directly boosted ISIS’s combat power in the province. Several additional attacks indicated that ISIS had become active in eastern Diyala by the same time. Two VBIEDs detonated in Balad Ruz, in eastern Diyala in February and May 2015, respectively. On June 16, an IED detonated in the same area killing one individual and wounding another. On June 23, 2015 ISIS launched a suicide VBIED against a tribal gathering of Iraqi Sunnis in the Nida area of eastern Diyala killing 16 individuals and injuring 36 others. These attacks may indicate that ISIS had carved out a support zone by this time in eastern Diyala; it may also indicate an emerging threat stream against the Iranian border crossing, which may be a key ground line of communication connecting Iranian resources to its proxies in Iraq. Underscoring this idea, IEDs detonated on June 25 targeting power lines near the Iranian border that transits Iranian-generated electricity to Diyala. Attacks by ISIS also began to occur elsewhere in Diyala province. On June 15, ISF clashed with and killed an unknown number of ISIS fighters near Qara Tapa, in northern Diyala. On July 1, Iraqi Sunni fighters aligned with Badr and the ISF repelled a small scale attack by ISIS targeting the agricultural area of Mansouriya, north if Muqdadiyah in central Diyala. Also, a VBIED detonated in Khalis, western Diyala on July 14, 2015, during Ramadan and shortly before the mass casualty VBIED attack on Khan Bani Saad on July 18. Mansouriya, Khalis, and Qara Tapa are located in disparate corners of Diyala province. As such, these separate incidents are indicative of the co-presence of multiple cells rather than one cell confined to one area. It is therefore not surprising that ISIS launched spectacular attacks in Diyala at the end of Ramadan. Both to mark the end of its annual campaign, and to divert attention from Anbar, ISIS elements in Diyala planned and executed the highly effective mass casualty attack in in Khan Bani Saad, indicating that they are fully operational. ISIS’s attacks in Diyala will now likely increase steadily unless increased security measures in the province prevent it. The recent attacks by ISIS in Diyala have prompted local officials to issue multiple calls for Diyala-based ISF and Shi’a militias to return to their home base and provide much needed security. On July 22, the provincial government convened to discuss Diyala’s security situation. Following the meeting, two officials stated that the council expressed the desire redeploy Diyala’s security forces. The acting chairman from the Iraqi Sunni from Iraqiyat Diyala bloc, Omar al-Korawi stated that the council “authorized” the governor to request from the Prime Minister a redeployment of Diyala forces. In addition, secretary of the council, a member of Mustaqilun bloc of the State of Law Alliance, Khdhayer al-Ubaidi stated that the council decided to redeploy Diyala’s forces, though it is unclear what provincial authorities exist for such a deployment. The response of the governor of Diyala, a Badr Organization member, did not align with the positions of the rest of the council as represented by these members. Instead, governor Timimi stressed that he will give no chance for “any politician from [Diyala’s government]” to cause stress and sedition, resisting the council’s pressure on him to make a decision to redeploy Diyala’s forces. Timimi’s reaction indicates just how entrenched the Badr Organization is within Diyala’s politics and security as of July 2015, such that Timimi likely did not wish to speak without consulting Hadi al-Ameri, the leader of the Badr Organization. Timimi made a more explicit response in a TV interview on July 22 in which he alluded to the overall authority of Hadi al-Ameri over him as a governor: “Haj Hadi al-Ameri is my direct security supervisor… he [Ameri] also supervises the operations command [Dijla Operations Command] and the division [5thIA Division] in the province… the government has officially assigned him supervision over security in the province.” This statement indicates that Timimi does not intend to answer to Diyala’s provincial council and will instead defer to Badr leadership. Disagreements about Diyala internal security will further complicate the political dynamics within the local government, especially if it generates tension among the various Shi’a blocs in the council, including Badr, the Sadrist Trend, and the various components of the State of Law Alliance. This may indicate that intra-Shi’a competition and sectarian tension may threaten Diyala’s stability in the near term in addition to the threat of ISIS. The recent deterioration of security in Diyala generated competing requirements for the proxies shortly after the Badr Organization and other Iranian proxy groups expanded their operations into Anbar. The expansion alone in pursuit of objectives independent of the Iraqi government speaks to their previous successes and high influence, resulting in a degree of impunity. Nevertheless, the exposure of Badr’s home base in Diyala to new security threats from ISIS and political rivals does not bode well for Badr’s ability to maintain its current offensive posture near Fallujah, let alone to continue expanding. Badr will most likely act to address the situation in Diyala. However, it is unlikely that Badr and the Diyala-based 5th IA Division can redeploy forces to the province without negatively affecting their offensive operations or exposing recaptured areas to the threat of a counterattack by ISIS. The threat posed by ISIS against Diyala is not the exclusive concern of Badr and Diyala-based ISF. The concern is most likely shared by the Iranian government given the extensive border Iran shares with the province. It is likely that Iran desires to utilize Badr or other proxy groups to fill security gaps in Diyala for its direct security interests as well as its other strategic objectives in Iraq, such as increased political influence on a national stage. However, Iran also likely desires to continue the expansion of militia operations that challenge the dominance of the ISF and the influence of the U.S., and therefore withdrawing forces from Anbar would also constitute a loss for Iran. Iran may therefore increase its involvement in Diyala’s security if other mitigation measures do not materialize. Options of Badr, although limited, are not confined to the departure of Anbar or exposing Diyala to more security threats. The Badr Organization will likely work to mobilize more recruits within Diyala to provide security in areas witnessing security breaches. Although less likely, Iraq’s interior minister, himself a senior figure in Badr, may use his influence to draw ISF elements from southern provinces to cover down in Diyala. Deployment of provincial Federal Police units from the south took place on several occasions in support of anti-ISIS operations in previous instances, particularly after the initial fall of Fallujah to ISIS in January 2014. However, such a move would likely generate push back since most south-based Iraqi Army units are already deployed forward along other front lines and away from their provinces. Indicative of this dynamic, on July 15, 2015, the local government of Babil requested that the interior minister exclude a Babil-based ISF battalion from deploying to Ramadi, citing provincial security concerns. The implications of deteriorating security in Diyala therefore rather rise to the national level. A shift of Badr Organization forces and other proxies back to Diyala will directly affect other multiple anti-ISIS fronts in Iraq. On the one hand, a reduction in force levels combatting ISIS on fronts such as Anbar will undermine the fight on other fronts. In Anbar, the ongoing militia-led operations around Fallujah and ISF-led operations around Ramadi are complementary, in that they prevent ISIS from reinforcing one city from the other. Although Iranian proxies are not responding to ISF leadership in Anbar, their operations remain relevant. On the other hand, however, a withdrawal of the proxy groups from Anbar may also clear the way for the ISF and U.S.-led coalition to orchestrate its own successful campaign in both Fallujah and Ramadi, if they have enough capacity. Like Tikrit, Ramadi and Fallujah can be a front on with the ISF with U.S. support demonstrates its superior performance in Sunni cities long held by ISIS relative to that of the Iranian proxies. The ISF also must balance its offensive campaign against the necessary defense of the capital and Diyala, however, and ISIS will likely aim to increase attacks in Diyala and Baghdad in order to relieve pressure on Fallujah and Ramadi. It is important to watch for counter-attacks at this time by ISIS in recently cleared cities on other fronts, such as Tikrit, Sadia, and northern Muqdadiyah to generate a higher sense of urgency for the ISF and proxies as the Ramadi assault approaches.